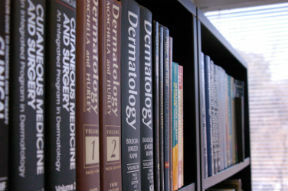 Georgia Dermatopathology Associates is pleased to offer these links to professional organizations, professional journals and technical information. We have found this information immensely helpful—we hope you do, too. American Power Conversion, founded in 1981 in Massachusetts, currently has U.S. headquarters in West Kingston, Rhode Island. Georgia Dermatopathology is pleased to recommend the company's IT servers for on-demand applications, as well as its 24/7 electrical surge and power protection equipment. We strongly recommend Dako Corporation for both automated immunohistochemistry staining systems, as well as monoclonal and polyclonal antibody supplies. Dako Corporation, established in 1966, has U.S. headquarters in Carpinteria, California. We utilize and are proud to recommend the Olympus Corporation's technologies for both 1) group microscopic teaching and 2) group microscopic quality assurance applications. The company was organized in 1919, and has USA headquarters in Melville, New York. Georgia Dermatopathology is pleased to recommend the Nikon Corporation, founded in 1917, as our supplier for primary diagnostic light microscopy and immunofluorescense equipment, as well as digital color microphotography technologies. Nikon USA is headquartered in Melville, New York. Thermo Electron Corporation provides outstanding service for our primary anatomic pathology histotechnology equipment and reagents. The company, honored as a Fortune Magazine Most Admired Corporation in 2004, is headquartered in Waltham, Massachusetts. We utilize and recommend the Invitrogen Corporation as our supplier for molecular biology equipment and reagents, supporting both advanced dermatoimmunology diagnostic techniques, as well as research applications. We specifically utilize fluorochromes from the company's Molecular Probes division(Eugene, Oregon) in our direct and indirect immunofluorescense testing and research. Invitrogen Corporation, founded in 1987, is headquartered in Carlsbad, California.